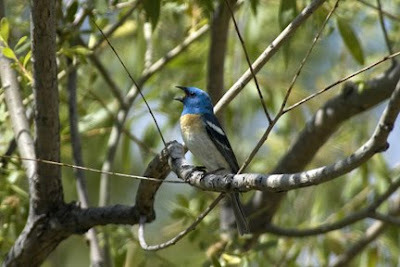 Lazuli Bunting Male, singing in breeding habitat east of Sparta, Baker County, June, 2008. Writing about spring migration in Baker County is something that can become a bit formidable, due to time and the numbers of birds available. Instead of presenting information on all the migrants I have photos of, which are at least several, the task has been broken down into segments. As I'm beginning this project a little past the peak, perhaps, of the migration, it seems that writing about a few birds that are passing through right now might be most useful to anyone who is interested. If you are interested, and would like to attract birds to your home, there are at least two factors to consider. Food and habitat. Perhaps the most important is readily available food for birds that are currently on an energy intensive migration from many miles away, and who in many cases will have many miles to go. This is not likely a high priority item in the budgets of many Baker County residents, but if you want to see many migrating and other interesting birds at your home, it is essential, because they will not linger unless food is available. At this time of year, an important and sought after energy source is "black oil" sunflower seed, because it is rich in fat, carbohydrate, and protein, which will help many birds replenish depleted energy supplies and provide other needed nutrients after an exhausting trip. They also will readily eat the millet-sunflower mix such as that provided in the "Audubon Park" mix sold by Bi-Mart and the millet mixes sold by D&B and other and other retailers. 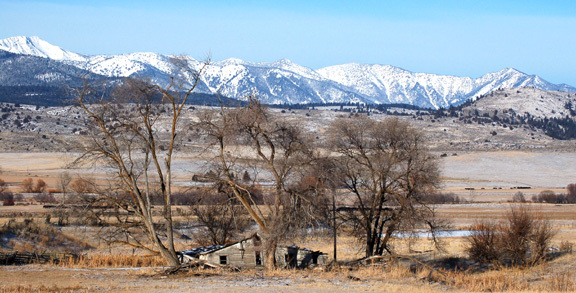 The Bobolink in La Grande is an excellent source of all types of feed, feeders, bird boxes, and expert birding advice. This shop is at 1102 Washington Avenue, La Grande, OR 97850-2534, Phone: (541) 963-2888. Another expert birding friend of mine here in Baker County, Jim Lawrence, goes there for good value, and the owner, Trent, as an expert birder, can answer questions that the other retailers can't. Black oil sunflower alone is available from Bobolink, D&B, as well as Bi-Mart and some feed stores. For goldfinches (AKA "wild canaries" around the West) and pine siskins, I often will put out one or more specialized "thistle" or "nyger" seed feeders, the two most common of which are nylon socks and normal looking feeders with a small opening that the narrow bills of the two birds are adapted to. If there is food available, birds will stay long enough for you to get a good look at them. I put feeders in both the front and back yards. As I spend an inordinate amount of the time at the computer, checking e-mail, processing photos, and sometimes writing, I have a flat, open feeder stationed just in front of the window by my computer desk, which in this case, also doubles as a dining room table. Also, out front in the tree beyond that, are other feeders. Right now, I have three black-headed grosbeaks squabbling as they seek out sunflower seed in my window feeder. An hour ago, there were six of them on the feeders I can see out the window. In the back yard, I hang a seed feeder of some sort, along with hummingbird feeders. 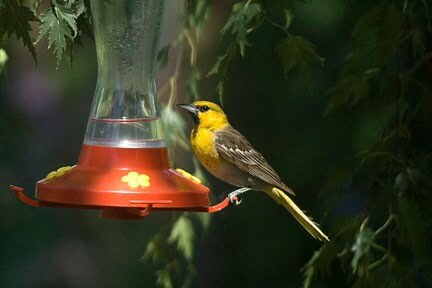 Hummingbird feeders can double as oriole feeders, especially if you can find the feeders with bee guards that fit over a tube. When you remove the bee guard, the orioles can easily access the sugar water that they will utilize as if it were wild flower nectar that they cherish. Additionally, and importantly, I also throw out millet-sunflower mix onto the walkways and grass in both back and front. The persistent intrusions of the introduced fox squirrels are a real challenge, and they are ingenious at finding ways to get to the feed, but some feeders are designed to foil them, and hanging a feeder on a thin long wire also helps, as will well designed caging of the feeders. Good luck out-foxing the fox squirrel! The second, more problematic, but no less important item you can provide is habitat. 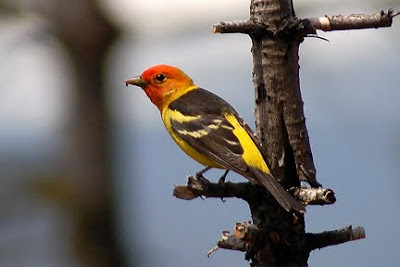 A mix of old growth trees which may provide both insects and seeds, like conifers, birch, and, god forbid, the ubiquitous and messy elms, will help bring in many migrants like warblers, tanagers, and lazuli buntings. Others, like towhees, some finches, and sparrows, like the cover provided by brushy borders around grassy open areas. Many of the commonly used ornamental shrubs will do, but it is best to chose those with edible berries, or hummingbird-attracting flowers (Forsythia and Japanese quince come to mind). While not really a neo-tropical migrant (basically a bird that travels far south to warmer and friendlier climate in winter), the migratory, sleek, and beautiful cedar waxwings will also visit your home one or more times a year if you plant the shrubby, small-leaved ornamental junipers that you can find planted at 11th and Westview here in Baker City (see photo below). 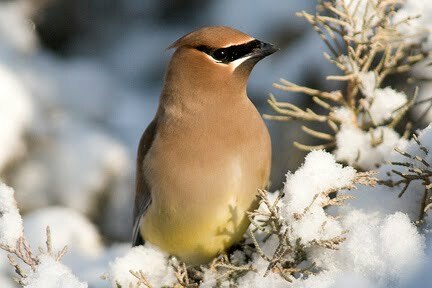 I have them in my yard, and the waxwings have visited many times since the New Year. (These plants require less water than most, but flourish in good sunshine for a decent part of the day. Waxwings also prefer Oregon Grape, an easily maintained native, that has berries in the fall and winter, as well as showy clusters of yellow flowers in the spring. Unfortunately, the introduced pest bird, European starling, will often strip the shrubs of berries before the waxwings arrive. Now onto a few of the migrant birds that are in Baker City right now. I've had three male tanagers here yesterday and the day prior. They are among our most beautiful and colorful birds and, in my exerience, only stop here in May, on their way to local and more northern coniferous forests, although they also frequent deciduous forests. Previously, it was thought to be related to the next group we will look at, the Cardinals and relatives, but further research has muddied the waters as to their close relations. Locally, they inhabit ponderosa forest, especially older trees, and also riparian cottonwood groves. Like many birds, they are secretive and once sighted will disappear into dense foliage. The females are more subdued, and lack the red-orange colorationon the head. They primarily feed on fruit and insects and their song is easily confused with that of the Amerian robin (at least by me). This bunting, related to the well known red northern cardinal, is also among our most gorgeous migratory song birds. I've never encountered so many as in this year, from my yard during the last two weeks, on down to Richland. 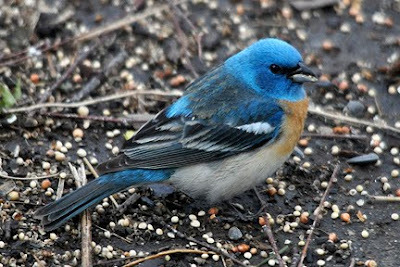 They inhabit riparian areas adjacent to more arid scrub, like sagebrush, in the higher portions of the interior western U. S. The males, with their bright blue heads and buff to cinnamon breasts are unmistakable, but the females, once again more drab, with blue tails and less distinct wing-bars, are less often noticed. The males are very territorial and will quickly respond to recorded calls during breeding season. They primarily feed on seeds, for which their bill is adapted, but also feed on insects. They, like the next bird, to which they are related, like a sunflower-millet mix at the feeder. Male Black-headed Grosbeak, Baker City, May 17, 2010. 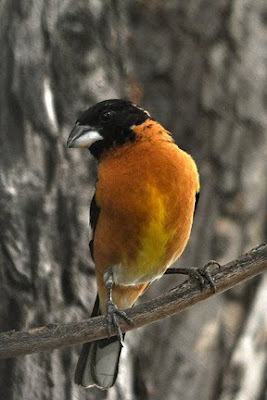 The large bill of the colorful Black-headed Grosbeak is specialized for breaking open seeds and eating fruits, although, as the next photo will show, they also eat insects (normally during the breeding season). Like most birds of the Cardinal family, these grosbeaks are monogamous, and they have sharp. clear songs. They have flooded my feeders during the last few days, with, as noted above, as many as six males and females being visible out the front window Their preferred habitat is mature deciduous woodland, which is becoming scarcer by the day, as population growth, grazing, and generally poor habitat management puts increasing pressure on the regeneration of these woodlands. 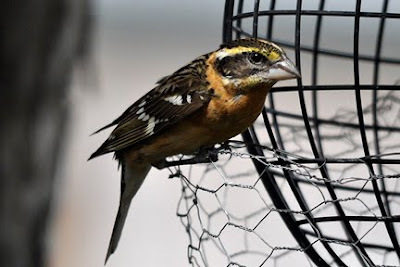 The photos below give examples of female Black-headed Grosbeaks. Female Black-headed Grosbeak, after having caught an insect in the maple tree out front. Female Black-headed Grosbeak, trying to figure out how to get into feeder with a squirrel guard (actually, a bit of a problem). The western Bullock's oriole is closely related to the eastern Baltimore oriole, and will, occasionally, hybridize with it. The family includes the meadowlarks, blackbirds, and grackles, the latter which may become familiar to you in the ensuing decades, as climate change becomes more pronounced. Even though you will observe their many well constructed sock-like nests hanging from high cottonwoods or even in much lower willows in the riparian areas of Baker County during winter, most people rarely see them, even with their bright coloration. I find them to be highly secretive, vanishing into the foliage of nearby trees or shrubs of their usual habitat once they observe the human presence (who can blame them?). They eat primarily insects, although they do like nectar, as mentioned above. Winters are spent in Mexico and points south, but you can find large numbers of them in the lower Powder River canyon during summer. Last year, a pair nested in the neighborhood. 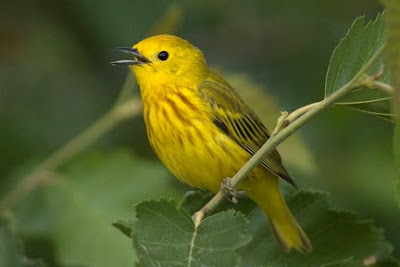 In my experience, the yellow warbler is the most common of our local warblers. Perhaps I think that is so because their bright coloration and territorial nature makes them easy to spot. Anyway, I love them, and their presence assures me that things could be worse. They always come through Baker City in May, and I can find them in my old European weeping birch and the problematic old elm trees here at home. Once you find them in neighborhood trees or along the riparian corridors, you will soon enough remember their high-pitched song. They are primarily insect eaters (insectivorous) but may also partake of berries or nectar. In Baker County you can find them during the breeding season in riparian habitats of willow and cottonwood, including along irrigation ditches where these plants grow. Cedar Waxwings are another of my favorites, and perhaps the most "handsome" of our north east Oregon birds. No human artist could have come up with a more pleasing design. This year, they have blessed me numerous times, as opposed to earlier years, but perhaps I am just paying closer attention. A small flock was visiting my elms this week. Like solitaires and robins, they go to the bitter extremes in berry eating, favoring, among others, the berries of the ornamental junipers, that even the starlings won't often touch. They are a highly migratory species, searching high and low throughout the northwest for favored fruits during winter. 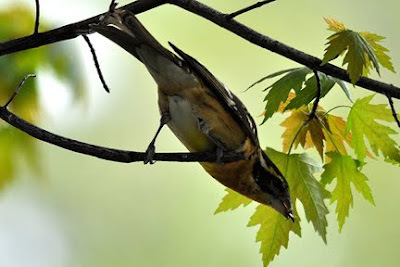 They also will eat the buds of trees like maples, and some flowers and insects. "Sleek" is the word most commonly used to describe them, and I can't disagree. They most often breed in brush along streams and neglected fields. The scientists say that the red appendages on their secondary flight feathers are composed of waxy droplets, hence their common name. The much less common Bohemian waxwing also inhabits our area. 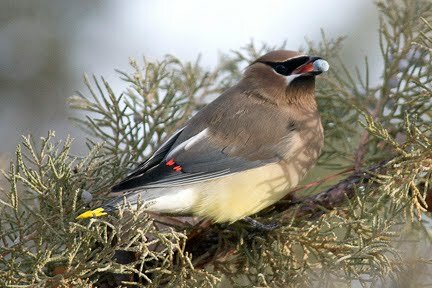 The Bohemian waxwing looks a lot like the cedar waxwing, but its rufous under-tail coverts and larger size help identify it. More on migratory birds in later editions I hope.